evo Size and Buying Guides - We have a one of the largest selections of outerwear on the web, a super knowledgeable staff and expert guides. You like to play in the snow and you want to stay warm and dry while you play. Enter waterproof breathable fabric, the key to being comfortable in the mountains. You need this for your jacket and pants if you ski or snowboard; take our word for it. 10,000/10,000? 20,000/20,000? What do the rating numbers actually mean? The second number is a measure of how breathable the fabric is, and is normally expressed in terms of how many grams (g) of water vapor can pass through a square meter (m2) of the fabric from the inside to the outside in a 24 hour period. In the case of a 20k (20,000 g) fabric, this would be 20,000 grams. The larger the number, the more breathable the fabric. Why isn’t outerwear completely waterproof? The truth is that all outerwear designed for active winter sports has various degrees of water resistance, but will eventually leak given enough water, time and pressure. Manufacturers define “waterproof” according to different standards, and testing is not standardized. A rubber raincoat is completely waterproof, and may be the ideal garment for standing in a downpour waiting for the bus, but if you tried to ski or snowboard in it, you’d be wet in no time from your own perspiration. 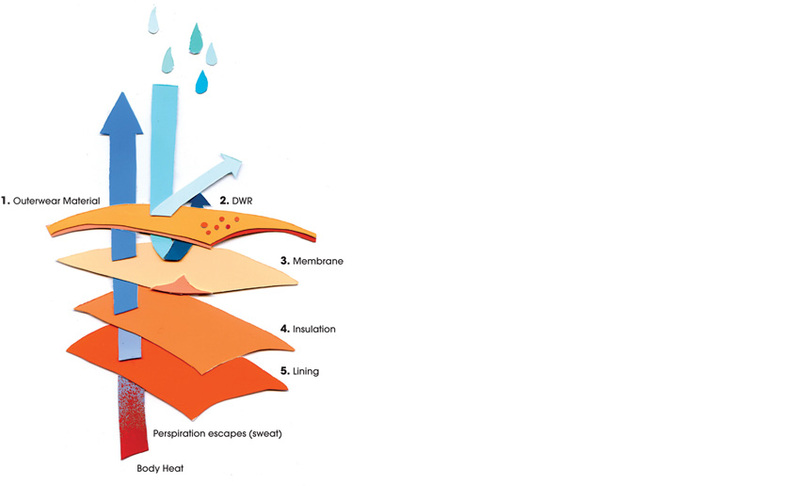 The trick is to balance protection from rain and snow on the outside with the ability to let water vapor (warm perspiration) escape from the inside. Waterproof breathable fabrics consist of an outer layer called the “face fabric”, usually made of nylon or polyester, and a laminated membrane or coating, usually made of ePTFE (expanded Polytetrafluoroethylene, also known as Teflon®) or PU (Polyurethane). The purpose of the face fabric is to protect and look stylish; it’s not waterproof but is treated with a solution called DWR (Durable Water Repellent) so it doesn’t soak up water. The job of keeping the water out is left to the membrane, which has tiny holes too small to let liquid water enter but large enough to allow water vapor to escape. 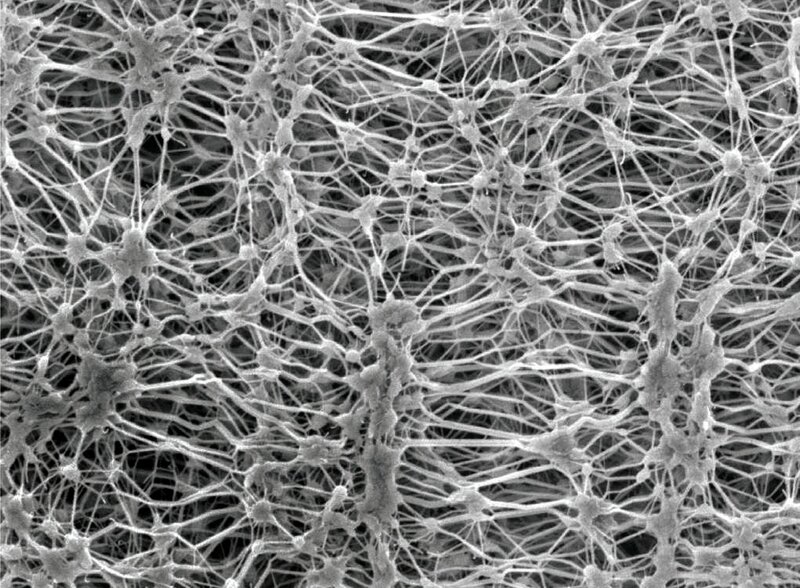 Since contamination with oil, sweat and many chemicals causes PTFE membranes to lose their ability to keep out water, the membrane is protected by an ultra-thin layer of Polyurethane (GORE-TEX® membranes have a bi-component laminate structure) or other oleophobic (oil-hating) treatment (eVent™ does this at the microscopic level with individual PTFE fibers). Finally, a fine scrim or mesh is bonded to the inner surface for comfort in 3 Layer (3L) fabrics. 2 Layer (2L) fabrics receive a separate fabric liner, while 2.5 Layer fabrics use an abbreviated pattern screened on the inner surface to save weight. Modern waterproof breathable fabrics have come a long way since the original GORE-TEX®, and most are extremely waterproof at any price point, but outstanding gains in breathability in the past few years have redefined the market in high exertion outerwear. How waterproof a garment do I need? We recommend a minimum waterproof rating of 5,000 mm for ski and snowboard outerwear. If you ride primarily in cold and clear conditions and take regular lodge breaks this level of protection could be fine, but anything less and you stand a good chance of getting wet and cold in a storm. Clothing rated between 5,000 mm and 10,000 mm is a good choice for riders who spend long days out and ski or snowboard in any weather conditions. Avid snowsport enthusiasts, especially those in wetter climates, should look for waterproof ratings in the 10,000 mm to 20,000 mm range or better. If you spend a good percentage of your time in the backcountry or hiking or skinning to remote locations, breathability becomes equally as important as waterproofing – look for outerwear with both waterproofing and breathability in the 20,000 plus range. As you might expect, higher ratings in both categories will usually mean higher prices. Remember that while a 20,000 mm rating may sound impressive, a hard day of riding in wet conditions with the added pressure of wind, sitting, and falling puts even the most waterproof fabrics to the test. How are waterproof ratings determined? Waterproof ratings are determined by the clothing manufacturer or fabric producer, with testing done either by independent laboratories or in-house. There are a number of different testing protocols in use, but most involve the equivalent of placing a 1” x 1” square tube over the fabric and determining how high (in millimeters) a column of water you can suspend over it before it starts to leak. Some manufacturers have developed their own testing methods that involve adding pressure to the process to simulate the effects of wind. While waterproof ratings are becoming more standardized, remember that different labs may test or report differently, and may come up with different results even with two pieces of fabric from the exact same roll, so take the numbers with a grain of salt. Keep in mind that some manufacturers report waterproof ratings in PSI (Pounds per Square Inch) rather than millimeters, which has a conversion rate of 704 mm = 1 PSI. How breathable a garment do I need? Well, it’s tempting to say “more is better” but the real answer depends on your level of activity. A layer of warm, moist air between your body and your shell can mean warmth as long as your underlayers don’t become saturated with moisture. In cold, dry weather a super breathable shell can actually lead to visible clouds of water vapor exiting the wearer’s body, which leads to heat loss. It’s not uncommon for owners of eVent™ jackets, for instance, to need more insulation under their shells to stay warm. If all your riding is lift-served, you don’t hike to out-of-the-way lines, and you take regular breaks in the lodge where you remove your coat, a breathability rating of 5,000 to 8,000 grams will probably be fine. If you do a lot of “high energy” riding or active sidecountry where you often break a sweat getting to your destination or returning to the ski area, look for breathability in the 10,000 to 15,000 gram range. Backcountry hardcores and people who commonly skin or boot for thousands of vertical feet in a day should look for garments with breathability in the 20,000 plus range. How are breathability ratings determined? Like waterproof ratings, breathability ratings are determined by both manufacturers and independent labs, but the testing methodologies are quite diverse and almost impossible to compare with each other. Results can vary wildly based on test, temperature, humidity and pressure and are not standardized from brand to brand, or test to test. Most testing doesn’t reflect real world winter conditions, like near freezing outside temperatures with high relative humidity. Since manufacturers seldom reveal the actual test used, and are probably keen on reporting the highest possible figures to promote sales, it’s best to read these numbers with the eye of a skeptic, but generally within a given brand or family of fabrics it’s safe to say more grams is more breathable (if a company grades breathability on an RET scale – Resistance to Evaporative Heat Transfer – a lower value is better). Waterproof breathable fabrics with ePTFE membranes, led by GORE-TEX®, have dominated the market for years and still tend to offer the best combination of waterproof breathability at the high end of the market. eVent™ fabric, which forgoes the monolithic (solid) Polyurethane protective layer on the fabric's interior, has raised the bar on breathability for hard shell fabrics over the past few years. As technology allows the creation of thinner and thinner layers, high performance Polyurethane and Polyester membranes are beginning to take up a larger portion of the market. Examples are Marmot's MemBrain® (Polyurethane) and SympaTex (Polyester). ePTFE membranes tend to be quite dimensionally rigid, while Polyurethane membranes have some give and are suitable for stretch fabrics. Membranes come in may different types and price ranges, but chances are you'll want a 2 Layer or 3 Layer fabric with a laminated membrane if you're looking for a versatile and durable snow garment. 3 layer fabrics (3L) have all the layers including the lining bonded together, while 2 layer fabrics use a separate fabric lining which makes for a bulkier garment overall. 2.5 layer fabrics have a raised pattern screened on the inside to keep it off your skin and are usually reserved for superlight rain garments. Coated fabrics tend to be very waterproof but lack breathability in comparison to membrane laminates. These fabrics are less expensive and are improving as manufacturers finds ways to make the coatings thinner and more porous. Coated fabrics are great for emergency weather protection or for activities that don't involve a high level of exertion. What is seam sealing and why is it important? Seam sealing, sometimes referred to as seam taping, covers the tiny holes made by the needle in the sewing process so they don’t leak, using a heat application of thin waterproof tape. Sometimes seams are bonded together using glue or heat, but typically they are first sewn then taped. Garments can be either “fully taped” or “critically taped” – the difference is that a fully taped garment has every seam taped, while a critically taped one has tape only on high exposure areas like the neck, shoulders, and chest. Without adequate seam sealing you’ll get wet even with the best waterproof/breathable fabric. DWR stands for Durable Water Repellent. Almost all outerwear exterior fabrics are treated with some sort of DWR. It’s meant to keep the fabric from becoming saturated with water and adding weight. DWR causes water to bead-up and roll off the fabric and is affected by abrasion, dirt and body oils. This is why after some use, a garment will appear to no longer be waterproof. This isn’t the case, though - it likely means the DWR needs to be refreshed by simply washing the garmet (follow the manufacturer instructions). The factory DWR treatment will eventually wear off, too. 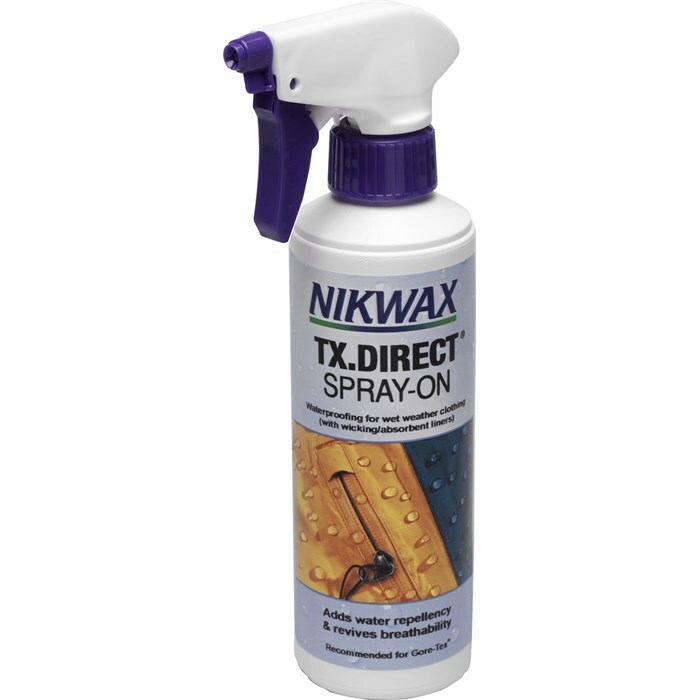 Aftermarket DWR sprays are available from companies like Nikwax to re-condition your waterproof/breathable garment after washing – try one of these if you notice water soaking into the face fabric of your Waterproof/Breathable garments and you have already attempted to refresh the DWR by cleaning your outerwear. DWR sprays are best applied to a damp garment after washing and thoroughly rinsing it (do a second rinse cycle without soap before you apply the DWR to make sure no detergent residue remains) and should be heat activated using a medium dryer or iron before use. Read the directions on both your garment and the DWR bottle before you start. Spray DWR applications are easier to use and less time consuming, while wash-in products will reach every nook and cranny of your garment, ensuring you do not miss any part. 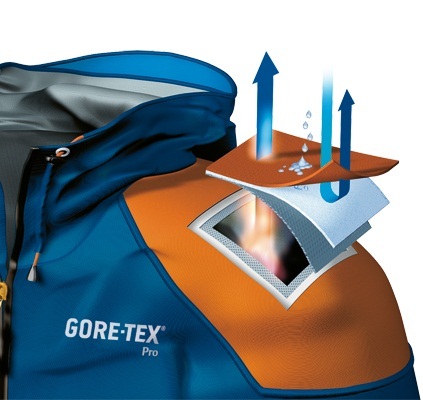 GORE-TEX® fabrics are created by laminating a GORE-TEX® membrane to high performance nylon and polyester face fabrics. They come in several different grades, including GORE-TEX® Pro, GORE-TEX® Active, and just regular GORE-TEX®. GORE also offers soft shell fabric and a super light 2.5L fabric called Paclite®. GORE-TEX® garments are fully seam sealed and feature a “GUARANTEED TO KEEP YOU DRY®” promise. Although many laminates are waterproof, a GORE-TEX® membrane is capable of maintaining an extremely high level of waterproofness while staying very breathable thanks to billions of microscopic pores that let water vapor out and prevent liquid water from entering. 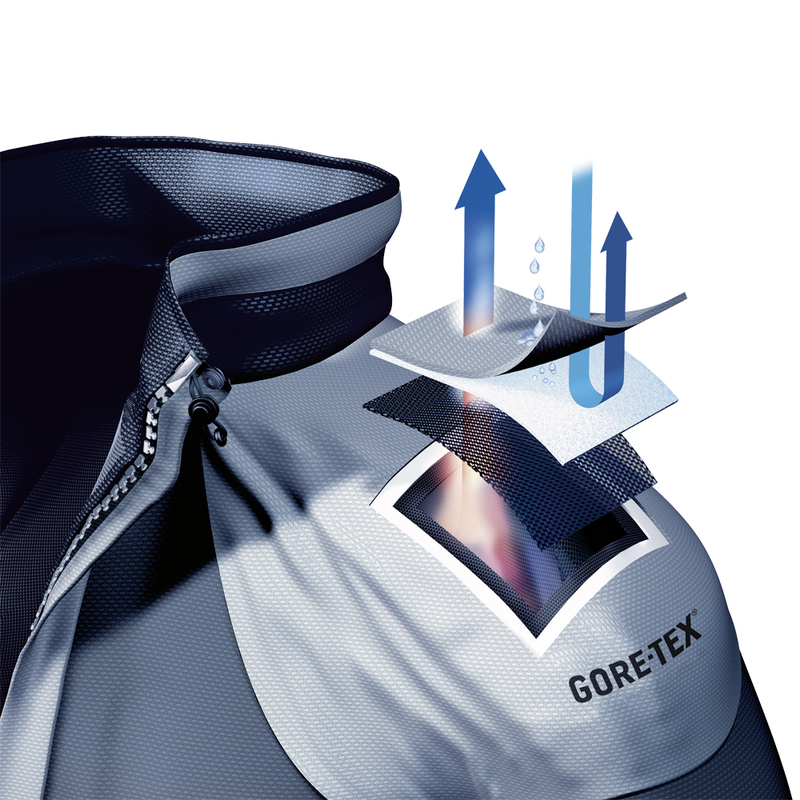 Introduced in 2013, GORE-TEX® Pro fabrics utilize a new membrane with no Polyurethane protective layer and significantly improved breathability. 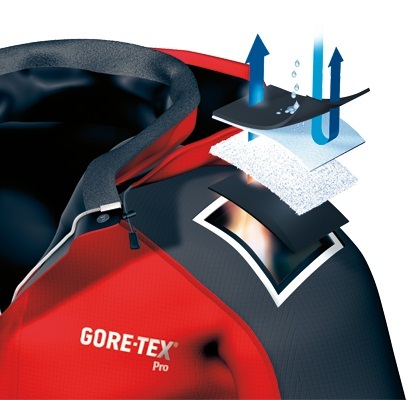 In 2015, GORE introduced a new backer technology for 3 layer GORE-TEX® fabrics called C-KNIT™ which uses a very fine nylon backer with a circular weave. C-KNIT™ fabrics also have improved breathability, a softer hand, and slide over mid layers more easily. While some people refer to all waterproof/breathable fabrics as “GORE-TEX®,” it’s a proprietary product and technology of the W. L. Gore Corporation. The W. L. Gore Corporation is zealous about upholding the reputation and performance standards of GORE-TEX® outerwear, and maintains a strict set of rules for any company making a GORE-TEX® garment. You don’t just buy their fabric and send it off to China for production. They require waterproof, breathability and durability testing of every garment in both design and manufacturing stages, mandate use of GORE seam tape and taping machines, and insist on current factory certification for any facility building GORE-TEX® jackets, pants, gloves or shoes. Serious business. It’s common in the outdoor industry for outerwear companies to offer a number of genuine GORE-TEX® garments for their flagship line, then a complete line (or several lines) of lower price point garments using their own proprietary membranes with lower waterproof/breathable specs. membrane, and gray strands are the lining. The white PU layer on the left has been replaced by the thin gray ePTFE "sandwich"
in the new version on the right. WINDSTOPPER® is a different, non-waterproof membrane also manufactured by the W. L. Gore Corporation that blocks wind and is highly breathable. It is usually laminated to fleece or softshell fabrics and suitable for strenuous outdoor activities in clear weather. The outdoor fabric industry is currently experiencing a surge in new product development that competes directly with GORE-TEX®. Products like eVent™, Polartec® Neoshell®, and Mountain Hardwear Dri.Q Elite (an eVent™ variant) are extremely waterproof and also push the envelope on breathability. eVent™ is owned by General Electric, which has decided to license its technology to qualified fabric and outerwear producers, so expect to see more proprietary eVent™ fabrics in the near future. Use of very thin Polyurethane and Polyester membranes is also expanding, with much of the innovation coming from Asia – these fabrics have the advantage of not requiring a separate layer to protect the ePTFE membrane from contamination, and are catching up in the breathability department. eVent™ - Fabric and technology used by multiple companies: oleophobic protective material is applied at a microscopic level to individual PTFE fibers to maintain their natural porosity and enhance breathability. eVent™ fabrics boast excellent waterproofing with outstanding breathability. MemBrain® - Marmot's proprietary waterproof breathable fabric with a PU membrane features excellent performance at reasonable prices. Polartec® NeoShell® - Fabric used by multiple companies: very supple and slightly stretchy fabric with a reported waterproof rating of ~10,000 mm and ground-breaking breathability. Unique membrane allows two-way air exchange to facilitate water vapor evacuation. Cold weather endurance athletes who require exceptional breathability are stoked about this fabric. Polartec® Power Shield® Pro - A highly breathable soft shell fabric that’s waterproof enough to wear most of the time in dryer mountain climates. Dry.Q Elite - Mountain Hardwear’s proprietary W/B fabric developed in conjunction with eVent™. By eliminating the thin continuous PU layer over the PTFE membrane, this technology allows the user to vent water vapor as soon as the garment goes on, without a buildup of moisture and heat. HyVent® - Waterproof/breathable fabric from The North Face available in several different models. TNF™ gives waterproof ratings in PSI (Pounds per Square Inch); HyVent® 3L, for instance, is rated at 25 PSI minimum after 20 washings with a breathability rating of 750-800 g/m2/24 hrs avg (MVTR) Upright Cup. (Keep in mind that Upright Cup numbers for a given fabric are typically much lower than those from other testing methods). H2No® - Patagonia’s proprietary W/B fabric, offered in 3L, 2L, and 2.5L versions. Patagonia also offers a full line of GORE-TEX® garments. PreCip™ - A coated technology exclusive to Marmot that offers great value in lightweight rainwear. This is evo. We are a ski, snowboard, wake, skate and clothing online retailer with physical stores in Seattle, Portland, Denver and Whistler. Our goal is to provide you with great information to make your purchase easy. Still have questions? Please give our customer care team a call at 866-386-1590, Customer Care Hours. They can help you find the right outerwear to fit your needs.